In a previous tutorial, we created a stacked "team" post type with custom fields. As you experienced, TypeRocket saves any and all fields. However, this level of flexibility is not always appropriate for security reasons. If you are an advanced developer you may only want certain fields to be fillable. For the "team" post type, whose ID we set to tr_team, the only fillable fields needed are photo, job_title and post_content. Making these fields the only fillable ones will prevent all other fields from being saved. This will make the new post type more secure and protect us from certain request attacks. 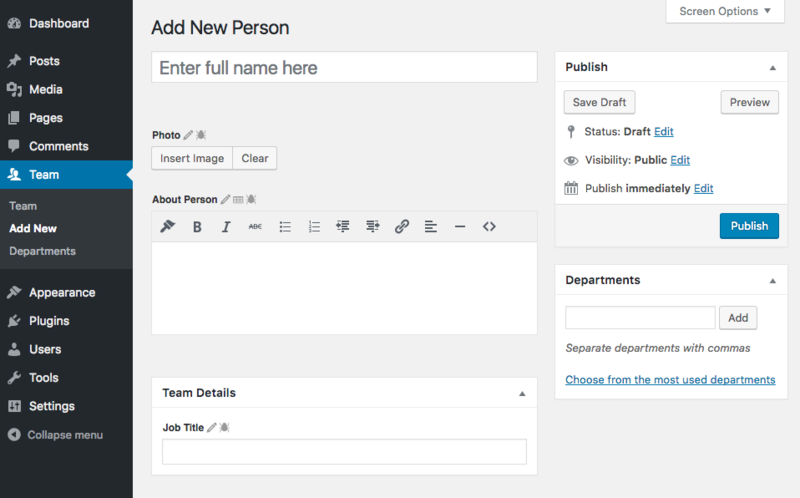 To limit saving data to only the photo, job_title and post_content fields a Person model and PersonController needs to be created. Use the TypeRocket CLI galaxy to create both the model and controller files, forgoing the manual process of creating the files. By setting the fillable property of the Person model we will tell WordPress to only save the specified fields. Once the fillable fields are set, in the WrdPress backend if debug mode is enabled, you will see a pencil icon next to the field label of each fillable field. Now, only photo, job_title and post_content will be saved. However, because the resource controller and model has been specified only an administrator can manage the new fields. If you need to customize who can update the fields configure your HTTP Kernel and Middleware. Middleware can be used for all kinds of fun things. For the PersonController we want the person resource to authenticate as a post type. By default, any resource without a named middleware group will default to the noResource group. To customize what middleware group PersonController routes through, add a group named person. Add the person middleware group to the bottom of the Kernel middleware property. Back at our Person model we can also format the photo when it is being saved. This allows us to filter and sanitize data before it is place in the database. If you need to keep the original state of data in the database then you can skip this step. For the photo field formatting it as an integer is best, since we reference it by the attachment ID. To do this define the format property and set an array key of the field name and the value to a callback. For the photo field we will use the php function intval as the callback.